Baandari Bruiser is a common Agility creature card. It is part of the Core Set. "There is no place for them here." "You will not pass this one." This card's pilfer ability applies the Thief in the Night card effect. 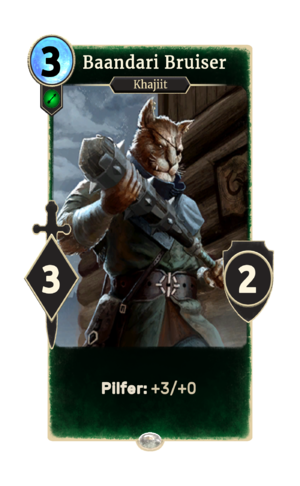 This card is named for the Baandari clan of Khajiit merchants that appear in ESO. This page was last modified on 15 February 2019, at 13:38.